Black American chefs and cooks are often typecast as the experts of only one cuisine--soul food, but Todd Richards' food is anything but stereotypical. Taste his Hot-Chicken-Style Country-Fried Lamb Steak or Blueberry-Sweet Tea-Brined Chicken Thighs as evidence. While his dishes are rooted in family and the American cuisine known as soul food, he doesn't let his heritage restrain him. The message of Soul is that cooks can honor tradition yet be liberated to explore. Todd Richards celebrates the restorative wonders of a classic pot of Collard Greens with Ham Hocks, yet doesn't shy away from building upon that foundational recipe with his Collard Green Ramen, a reinterpretation that incorporates far-flung flavors of cultural influences and exemplifies culinary evolution. Page after page, in more than 150 recipes and stunning photos, Todd shares his creativity and passion to highlight what soul food can be for a new generation of cooks. Whether you're new to Southern and soul food or call the South your home, Soul will encourage you to not only step outside of the box, but to boldly walk away from it. 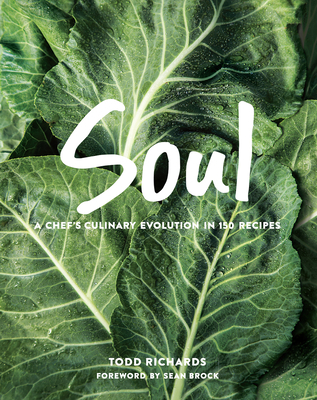 The chapters in Soul are organized by featured ingredients: Collards, Onions, Berries, Lamb, Seafood, Corn, Tomatoes, Melons, Stone Fruit, Eggs and Poultry, Pork and Beef, Beans and Rice, and Roots. Each one begins with a traditional recipe and progresses alongside Richards' exploration of flavor combinations and techniques. Todd Richards is a self-taught chef who paid his dues in numerous restaurant kitchens before becoming an executive chef who garnered national attention. He has two James Beard nominations for Best Chef in the Southeast, was an Iron Chef competitor, and was named one of "Four New Chefs to Watch" by Esquire magazine. He is the owner/chef of Richards' Southern Fried at Krog Street Market in Atlanta.